Isobel Thrilling was born in Suffolk, and brought up in a mining village in the north-east of England; she read English at Hull University and spent many years as Head of Service for Teaching English as a Second Language in a London borough. She first started writing after eye-operations that saved her sight. She is married, with a son, a daughter and two grandchildren. She has been widely published in magazines and newspapers, and her work has been included in many anthologies from publishers such as O.U.P, Longman, Hodder Headline and Macmillan. Her poems have been broadcast on BBC Television, ITV; and BBC Radio 3 and 4. Pauline Yarwood is a poet and ceramic artist living in Cumbria. Her poems have appeared in The North, The Interpreter’s House and Fire Crane( a number of poetry magazines). In 2013 she was mentored by Judy Brown at the Wordsworth Trust, and collaborated with artist Kate Bentley to write a short series of poems for her exhibition Skyline. She was co-director of this year’s inaugural Kendal Poetry Festival. She is a member of Kendal Brewery Poets. 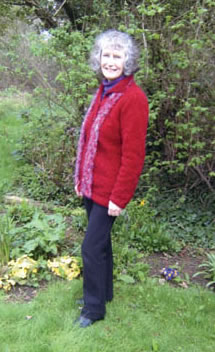 Born in Cumbria, Pauline grew up in Manchester but returned to the Lyth Valley in 1987 where she writes, makes pots and tends a very boggy garden next to the River Gilpin. 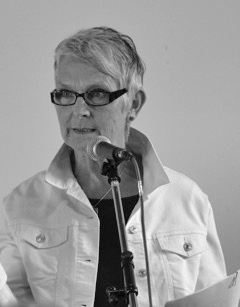 In the Read Two spot will be local readers John Rose, Olwyn Bolger, Kathy Swinscoe and Barbara Bowman. Our National Poetry Day celebrations will be on Thursday 6th October at 7.30pm at Victoria Hall in Settle and will feature poets Michael McCarthy and John Killick along with the winners of our national poetry prize, the North Craven School prize and the funniest poem in Craven!